Undercover agent Ed Newcomer og the U.S. 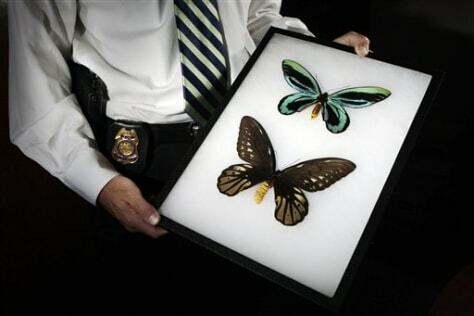 Fish and Wildlife Service displays endangered Ornithoptera Alexandrae butterflies, the male butterfly on top, at his office in Torrance, Calif. Also known as Queen Alexandra's Birdwing, the butterfly is among the largest and rarest in the world. It has a wingspan up to one foot and is found flying high above the rainforest in Papua New Guinea. A pair can sell for more than $10,000 on the black market.